A gaggle of Albuquerque cellists celebrated the life and work of Oak Park native Felix Wurman (1958-2009) founder of the Church of Beethoven Oct. 26 at the Sunday Chatter concert series in Albuquerque. 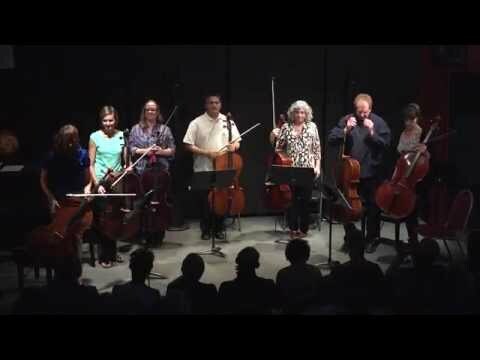 The performance, in honor of Wurman's birthday, gathered a group of cellists on stage at the Kosmos, an arts space started by Wurman before his death in 2009. The Kosmos is now run by a board of directors including Pamela Michaelis and David Crum. Violinist David Feldman, artistic director of the Kosmos and a close friend of Wurman, wrote transcriptions for cello of the pieces. Poet Richard Vargas, whose poems have been featured on Prairie Home Companion radio show, read. Wurman grew up in a musical Oak Park family, the son of European immigrants Hans and Brenda Wurman. He debuted at the Chicago Symphony Orchestra on cello in his teens. His quartet — named "Domus" after the portable geodesic dome under which they played— won a Gramophone Award (the British "Grammy") in 1980 for best Chamber Music Recording. Wurman founded Church of Beethoven in a repurposed gas station on Route 66 in Albuquerque. The group moved to the Kosmos Arts Space in 2009.